If you visit Copenhagen you will notice there are tons of bakeries. I can name 3 bakeries within one block of my place alone, and that seems to be pretty normal. It is great. :o) Not only is it easy to get freshly baked bread and pastries here, but they are usually made with quality ingredients. The only problem is that Denmark isn’t cheap, so a pasty can run you between $2 – $7 for a single serving, and if you want a whole cake? Well, that can be really pricey, depending on the place, of course. After living here for 5 years you can imagine that I have tried a lot of Danish pastries. So, I have decided to share my favorite ones. Now before I begin, you must know that some of the pastries might be something you find in your own country, but they are also found in pretty much every bakery here so to me they are typical “Danish” pastries. The flavors are all their own, and different from something similar I might have had back home. Lets start with Lagkage (Layer Cake). This cake is really popular here and is typically eaten as a birthday/celebration cake. There are many varieties, but it is basically a layer cake made with whipped cream, jam, and some kind of fruit. Since it is so popular and usually expensive to buy a whole Lagkage at a bakery, you can easily assemble lagkage yourself from cake (already baked), whipped cream, fruit, and jam bought from the grocery store here. If you want to learn a bit about how to make this cake click here. Next, we have Jordbærtærte (Strawberry Pie). 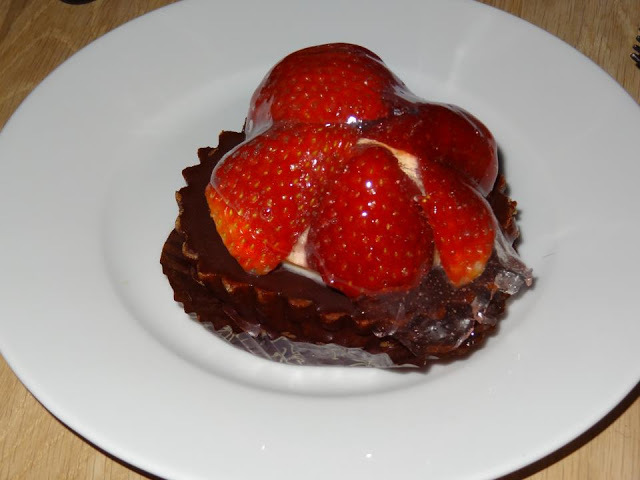 It usually has some kind of pie crust topped with dark chocolate, whipped cream, and strawberries with a layer of gelatin on top. The crust tastes almost like a butter cookie dipped in dark chocolate. It is really yummy. This next dessert that I love is called Æbleskiver (Apple Slices). 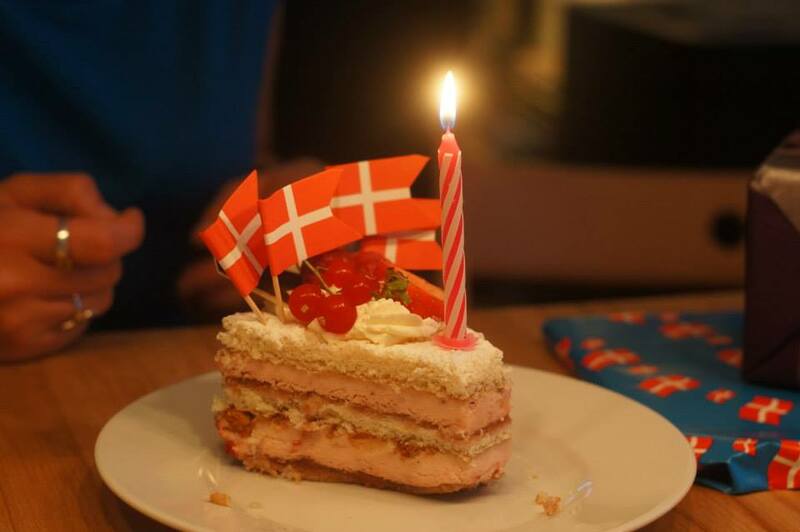 It is also found around Christmas time in Denmark, but usually not in a bakery. 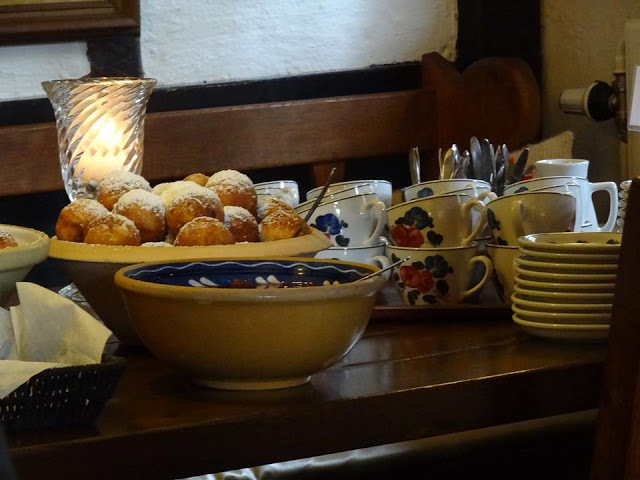 Instead you can find æbleskiver in an amusement park, frozen at the grocery store, at a Christmas Market, or in a restaurant. Despite the name, however, there are no apples in this dessert. Instead it is a kind of pancake batter fried in a special æbleskiver pan. It is usually served with jam on the side and powdered sugar on top. I also really love Medalje (Medal). Danish desserts tend to have a lot of whipped cream, if you haven’t noticed and Medalje is no exception. The name means Medal and it is suppose to resemble a medal looking at it from the top. 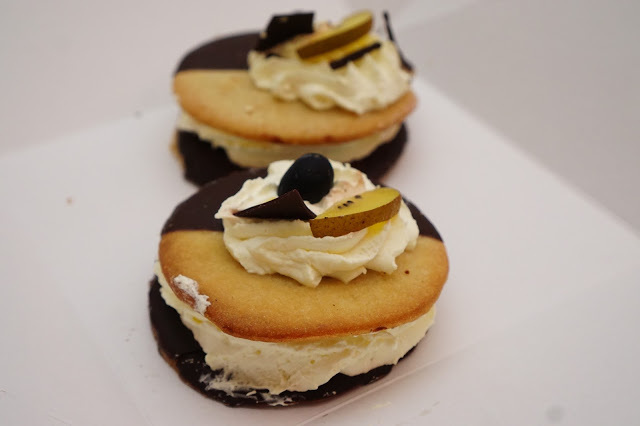 It is typically two butter cookies with whipped cream in the middle, a chocolate glaze, and fruit on top. I kind of think there is also a layer of cream and jam somewhere in the middle. Regardless, it is so good, but I still haven’t figured out how to properly eat Medalje. It can get a bit messy. 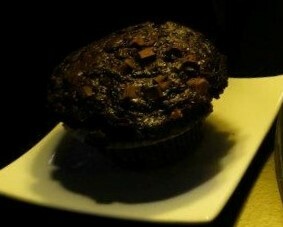 Last but not least, we have the Chokolade Muffin! You might be thinking what is so special about that? Well, a Danish chocolate muffin is usually a really moist, rich chocolately cake, with chunks of chocolate bits inside or on top, but not only that, it has a really special flavor that I can’t pin point what it is. Is there a dash of cinnamon in it? or extra vanilla? I have no idea, but I do know that it is soooo good. The picture below is blurry but you get the idea. 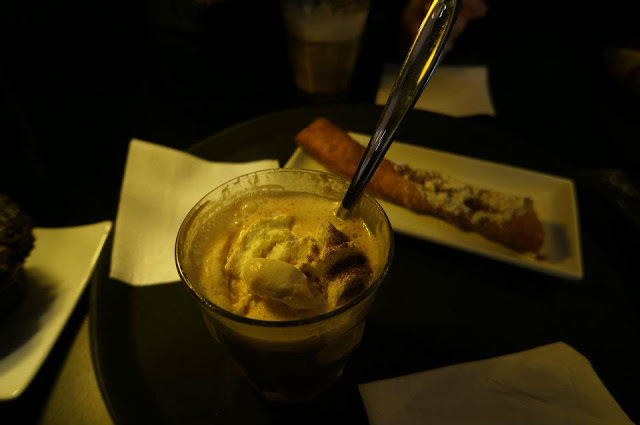 My favorite place to get this dessert is Lagkagehuset.